As an enthusiast brand, Mazda is somewhat set apart from the vanilla scope of every-day transportation. 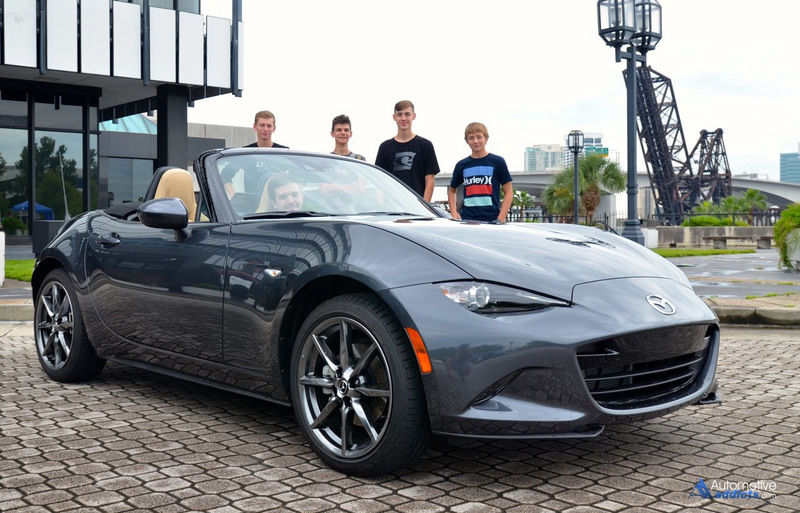 Even though Mazda has bridged their efforts to attract a wide audience that may fall outside of the spectrum of enthusiasts, their enthusiast roots have never been so alive when it comes to vehicles like the all-new MX-5 Miata. 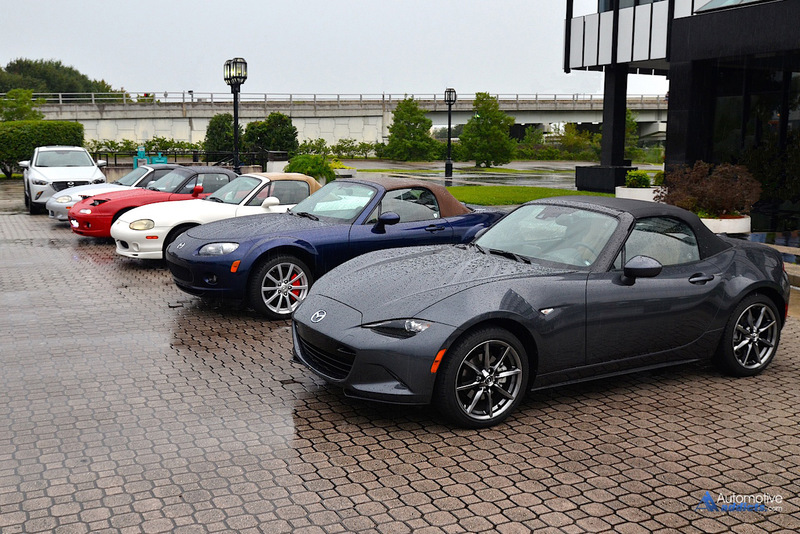 Search for clearance pricing on the Mazda MX-5 Miata from a network of dealers to get you the cheapest price. Use a simple form to select the make and model and start saving. Remember to get quotes from the maximum number of dealers to give you the upper hand. Get a Free Quote on the Mazda MX-5 Miata or other vehicles now. 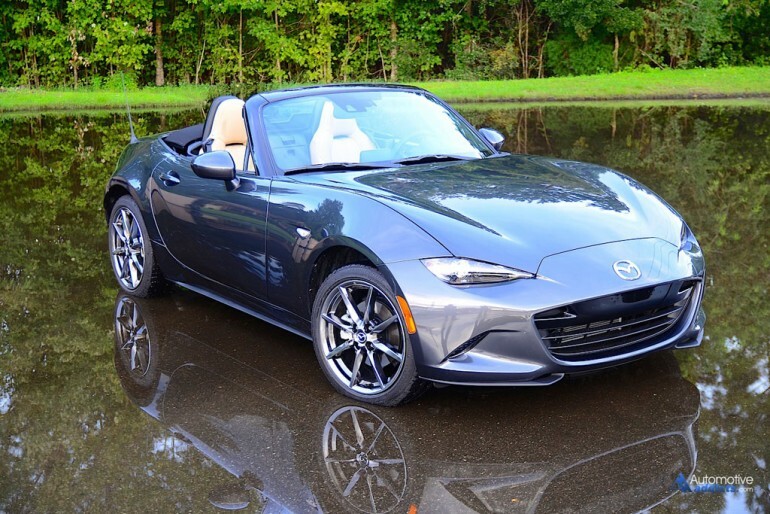 The Zoom-Zoom handle for Mazda is so fitting for the latest MX-5 Miata in that it retains that enthusiastic approach for one of the most regarded roadsters on the road today. 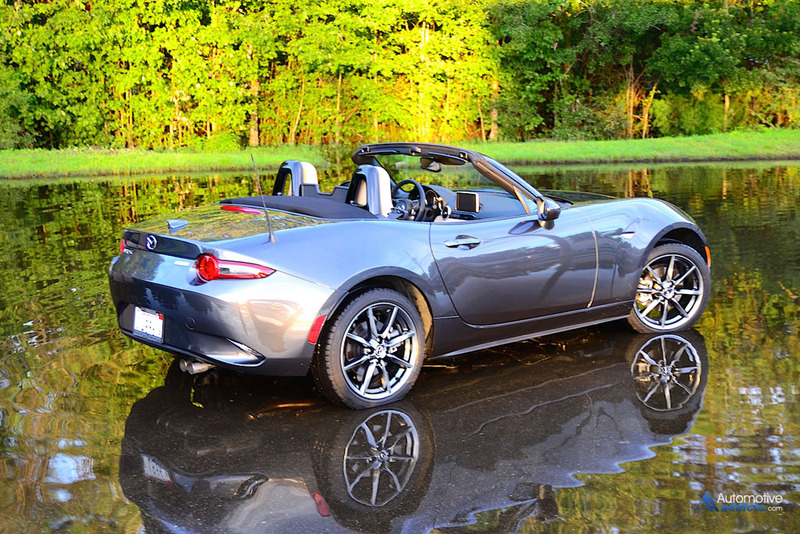 All the way from its start in 1989 to the latest 4th generation 2016 model year MX-5, the Miata has been a staple in automotive history that strives to appease the most discerning automotive enthusiast in many different ways. 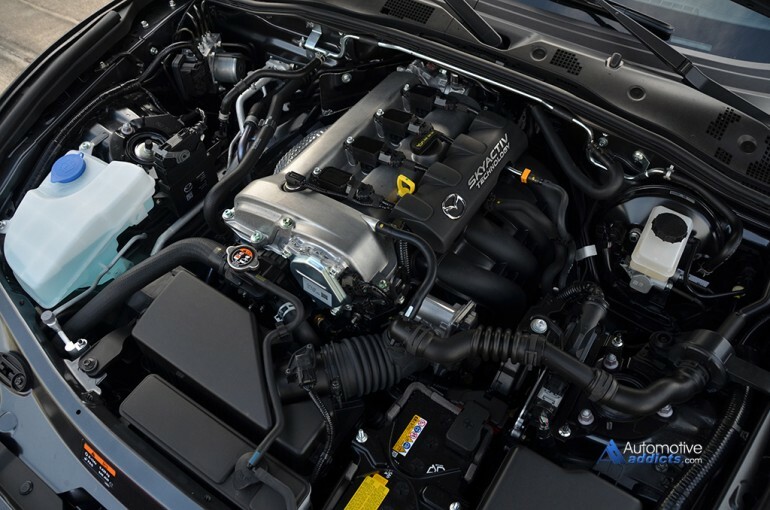 The new 2016 Mazda MX-5 Miata is powered by a 2.0-liter 4-cylinder engine with 155 horsepower and 148 lb-ft of torque. 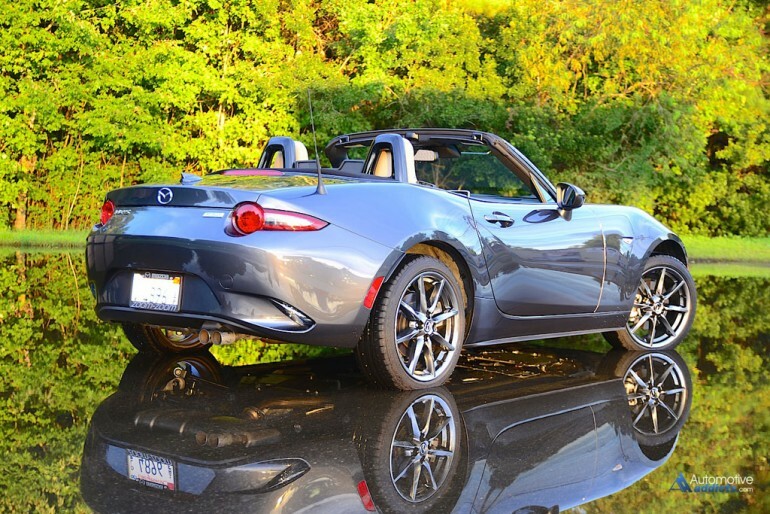 The SkyActiv-inspired technology is kicking with an attitude in the way the MX-5 Miata drives much like a spirited soul set loose from the captive chains dragging dead weight. Speaking of weight, the newest MX-5 Miata tips the physical scale at just 2,350 pounds, which enables the small power numbers from its eager 2.0-liter 4-cylinder engine to feel much more substantial and never a pushover. In a nutshell, the MX-5 Miata feels faster than its horsepower numbers would otherwise state. Zero to 60 mph comes around in just 6 seconds while the nimbleness of the rigid roadster chassis permits confidence even if the rear wheels, at the aid of a limited-slip differential, break loose. There is a bit of body roll initially when diving into turns but the returning reward is gratifying and later followed with howling tires and just enough grunt from the engine to power out without looking silly. Keeping things enthusiastic, the 2016 MX-5 Miata offers a standard 6-speed manual transmission while a 6-speed auto is optional. Surprisingly, in a world where automated dual-clutch boxes, CVTs and automatic transmissions are taking over like the Germans invading France at the cusp of World War II, there is a 50% take rate for the manual transmission so far for the MX-5 Miata this year. If anything, now is a time to celebrate Mazda’s prided roadster for championing the manual, one that proves to be direct in its shifts and inspires confidence with each gear landing at full throttle. The clutch pedal pressure is nearly perfect while the flywheel is light enough to do some smooth heal toe foot action to rev-match every downshift with ease. 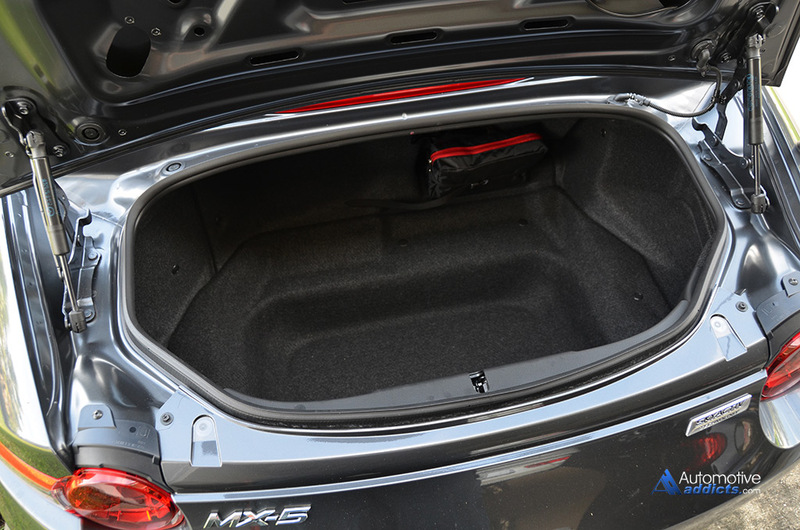 There is no getting around the smallish physical proportions of the MX-5 Miata. Its small size has worked to put it at a level athletic playing field with vehicles that have twice as much horsepower as it does. The pitfalls for this advantage are painfully obvious to folks like me, who stand just over 6 feet and 3 inches tall. I fit just fine in the new Miata’s cabin, even with the lightweight and quick folding/closing manual soft-top in its up-position. My knees come right to the dashboard with barely an inch to spare but it doesn’t keep my proportions from finding a relatively comfortable driving position while the nimble chassis, manual gearbox, and eager engine do their job to bring a smile to my face. Just don’t expect me to drive the MX-5 Miata cross country or anything outside of where full tank of gas will take you. The smiles don’t stop there; the new MX-5 Miata is as efficient as you want it to be. EPA estimates are 27 mpg city, 34 mpg highway and 30 mpg combined for my 6-speed manual Miata. Funny enough, pushing the new Miata to its limits around town still returns a decent mpg figure hardly ever departing far from its 27 mpg city estimate. 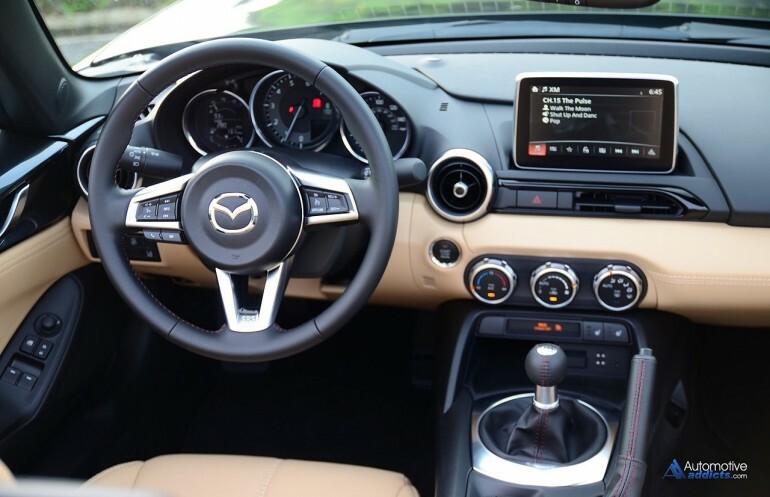 The cabin of the 2016 MX-5 Miata is form fitting with its simplistic bucket seats, limited soft touch areas, and a nice contrasting color scheme that confides to a short dash of luxury. The seating positions, although still on the small side, are larger than before with a lower seating position and better angles for reclining the seats. The hood is also lower allowing for better forward visibility and subtle wheel arches to signify right where your front wheels are being placed. The purpose-built aptitude of the new MX-5 Miata retains its lively character without diminishing its road or track-going abilities in being a roadster. The few creature comforts found on my loaded-up and top-level-trimmed MX-5 Miata Grand Touring were all welcomed with open arms. Some of the features, such as the blind spot monitor, lane departure warning, navigation system, adaptive front LED headlights, heated seats, rain sensing wipers, advanced remote keyless entry with push-button start, and a decent-sounding 9-speaker Bose audio system, are a nice touch for the condensed multipurpose abilities of the new MX-5 Miata. At a starting price of $24,915 for the base MX-5 Miata Sport, Mazda has retained its affordability in the ultimate fun machine that happens to be a roadster. My loaded-up Grand Touring MX-5 Miata tapped out to an as-tested price of $31,015 including an $820 delivery, processing and handling fee. The new 2016 Mazda MX-5 Miata is genius, unadulterated driving purity – no other way to put it.